There are various website that will give you a list of open proxies (IP: Port Proxy). A few of these lists will be for HTTP and HTTPS. This means that just your Internet browsing is being targeted. There are few that are for Sockets. This means that everything on your device will be anonymized. 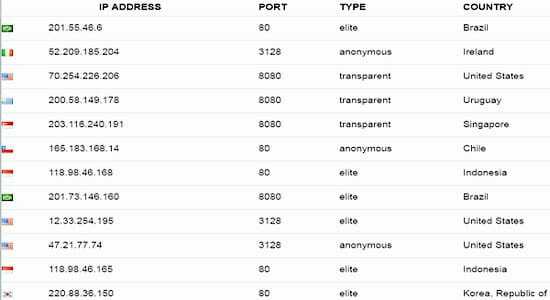 There are some other open proxies (IP: Port Proxy) lists that offer a completely different level of anonymity. Do note here that in case you are looking for a web site which allows you to type in the URL of the website that you wish to visit anonymously, and then takes you there immediately, then it means that you are looking for a Web Proxy Server, and not at some kind of a list of free proxy IP addresses. You would also need a list of the speed as well as the anonymity rating of each free proxy, besides the organization/ISP, geographic information like the city and country of origin. Why use open proxies (IP: Port Proxy)? You need to note that there is neither wrong nor illegal in surfing the net anonymously. It is only a means of protecting your own privacy. Thus when you use a proxy it will help to protect you from surveillance. It is required to give a voice to whistle blowers. It is also important for those who live in authoritarian countries and getting any information out may lead to them getting arrested, or worse! In other words, a proxy will help people who wish for their privacy and do not want that everything that they do on the Internet is monitored. They would not like their personal information getting sold to anyone and everyone who is willing to pay a price for it. Even the law allows protection against such interference or attacks. We have a right to our privacy and we cannot let anything, or anyone, take it away from us. Our online privacy is as important as the privacy in any other aspect of our lives. Have a list of the HTTP IP addresses that have a proxy server at that IP & Port. You can test this by seeing if the server responds to requests. Now copy the IP and port to your configuration. This way you can be sure that it will work in the way that you want! Even though lots of Public Proxies, Why Private Proxies? To answer this question, I suggest you read the post – “Problems with Free and Open Proxy Servers Know as Public Proxies” first, in short, the Open Proxies are slow and not Security! So, Usually lots of commercial staff use the Private Proxies to replace the public proxies. The private proxies use IP Authentication or Username/Password to limit the access of proxies. The Private Proxies are host fast dedicated server, so the proxies are fast and secure.